I love all foods that taste Mexican, even if it is Tex-Mex. 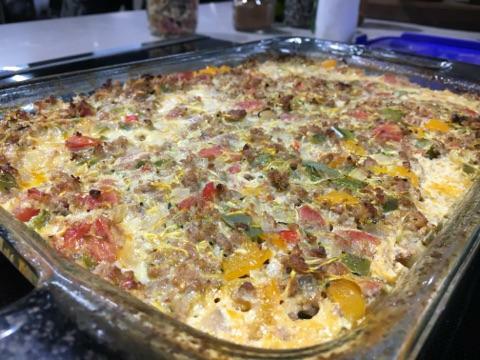 This Loaded Taco Casserole fits the bill for me and it is easy to put together to feed the family, or after it’s baked it can be cut up and frozen into individual pieces for a quick frozen meal. You can start with this homemade seasoning blend (hint, hint – if you double the recipe you can use it again later). Then build the casserole, pop it in the oven and you have a great meal! Make the taco seasoning by combining all ingredients (minus the lemon and lime) in a small mixing bowl. Heat 1 tbsp oil in a large skillet over medium heat and brown the ground beef, breaking up finely as you go, about 7 minutes. Add the taco seasoning, lemon, and lime, and stir until well incorporated and continue cooking for 2 minutes. Drain and add the tomatoes and stir, cook for about 2 minutes. Remove the mixture from the heat in a separate bowl and reserve for later. Add the remaining tbsp of oil to the skillet and raise the heat to medium high. Put the chopped onion, bell peppers, Fresno peppers, and garlic in the pan and sauté to aldente, about 6 minutes (salt and pepper to taste). Heat the oven to 425F and grease a large casserole dish with coconut oil. In a large mixing bowl, combine the beef mixture, zucchini, vegetables, and 3 eggs (beaten) until very well incorporated and pour into casserole dish. Tap dish on counter to smooth and even out, bake for 45 minutes or until the casserole is crispy on the edges and firm to the touch. 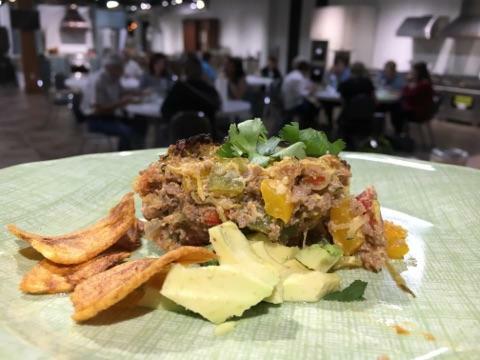 Serve with sliced avocado, fresh cilantro, and plantain chips. This dish is lovey plain, lovely topped with avocado, and even lovely cold. I had made it twice and the whole family loves it.